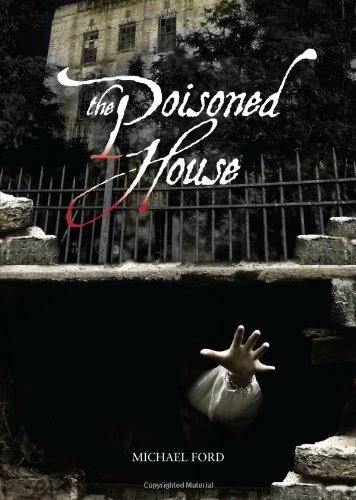 I have been dying to read The Poisoned House as soon as it arrived at my doorstep months ago. But I knew I was going to be hosting the Countdown to Halloween event, so I thought what better book to save for that? The premise instantly drew me in. A London, England setting, in the 1850's. A servant girl and a big old haunted house. Perfect for Halloween, right? The one thing that jumped out at me right away was the Authors writing style. Usually I don't notice a pattern or flow until at least 50 pages in, but Ford's writing style was bold and very well structured. And it was consistent through out the entire novel. From penning the setting right down to the old English language, he pulled it off flawlessly. I also loved how the author laid out the book. Almost every chapter ended on a cliffhanger, so you couldn't help but keep reading. The anticipation of what was going to happen next was too great, I would be reading well into the night because I simply couldn't stop. The book followed me everywhere. From my couch to the kitchen. From the gym to my workplace. Any chance I had, I would pick it up! Abi was a very strong willed character. A service maid is what she had to do to survive, but she knew deep in her heart that that's not where she belonged. She knew there were bigger plans for her out there. Her determination and boldness jumped off the pages. Michael Ford crafted a fantastic character in her. Although she was the main character, the author didn't lack when it came to the secondary characters. Every single person mentioned in the novel played a role into the grand finale. Now on to the ghostly stuff!! My spine tingled and my arms definitely grew some goosebumps throughout the book. Ghosts have always been a favourite thing of mine. I love horror movies like The Amityville Horror and Paranormal Activity. I watch Ghost Hunters and Haunted Collector. I have a high tollerance when it comes to that stuff, the scarier the better. The Poisoned House definitely lived up to my ghostly expectations! The Poisoned House is so much more than a "Ghost Story". It is a book about truth, self growth and right and wrong. A suspensful page-turner that will leave your spine tingling and looking over your shoulder. This sounds wonderful and I've not heard of it before. It's on my list! Thanks. This books sounds awesome! Updating my to-read list on Goodreads now! Thanks for the review! Really good ghost books are so hard to find! I'm definitely looking this one up! These kinds of stories are my favorites, you have done a great job by posting this useful post. Thanks for sharing.